Excel’s default recording mode is absolute reference. 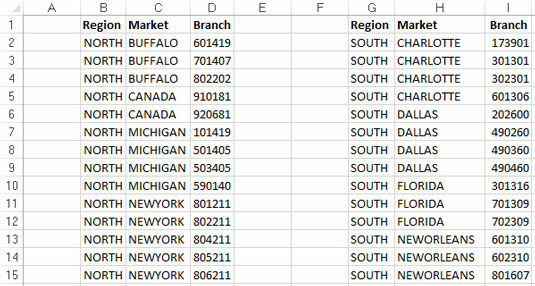 When a cell reference in a formula is an absolute reference, it does not automatically adjust when the formula is pasted to a new location. Your pretotaled worksheet containing two tables. You can find the sample data set used here online. Make sure cell A1 is selected. On the Developer tab, select Record Macro. Choose This Workbook for the save location. At this point, Excel is recording your actions. 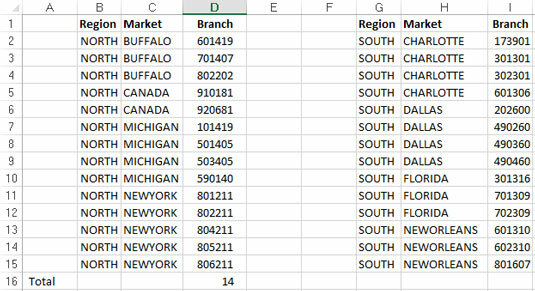 While Excel is recording, select cell A16 and type Total in the cell. Select the first empty cell in Column D (D16) and type = COUNTA(D2:D15). This formula gives a count of branch numbers at the bottom of column D. You use the COUNTA function because the branch numbers are stored as text. Click Stop Recording on the Developer tab to stop recording the macro. The formatted worksheet should look like something like the one shown here. On the Developer tab, select Macros. 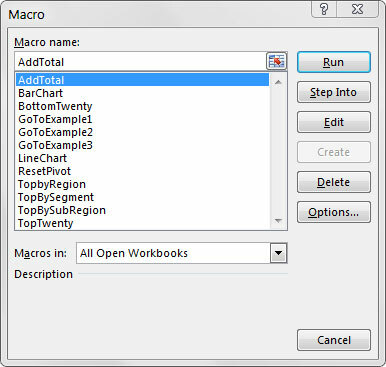 Find and select the AddTotal macro you just recorded. If all goes well, the macro plays back your actions to a T and gives your table a total. Now here’s the thing. No matter how hard you try, you can’t make the AddTotal macro work on the second table. Why? Because you recorded it as an absolute macro. To understand what this means, examine the underlying code by selecting Macros on the Developer tab. The Macro dialog box appears. The Excel Macro ­dialog box. Pay particular attention to the two lines of code that select range A16 and range D16. Because the macro was recorded in absolute reference mode, Excel interpreted your range selection as absolute cell references. In other words, no matter where your cursor is in your workbook, when you run the recorded macro, Excel will select cell A16 and then cell D16. In the next section, you take a look at what the same macro looks like when recorded in relative reference mode.